Katayama-ryu Iai-kenjutsu was founded by Jugoige (a court title of junior fifth rank) Katayama Hoki-no-kami Fujiwara Hisayasu. There is one theory that Katayama Hisayasu was a student of Hayashizaki Jinsuke (often said to be the founder of iai), but according to the old records of Katayama-ryu he inherited the secret teachings of the koden juhatto (literally “18 Ancient Sword Techniques”) from his uncle Shoan. Over New Years 1596, he confined himself in Atago shrine on Mt. Atago in Kyoto for seven days and seven nights. It has been passed down that on the last night he saw the character kan in a dream and was enlightened to the secrets of the technique Iso-no-nami. Due to this he is said to have founded his school as Ikkan-ryu, but in various domains the names like Hoki-ryu, Katayama Hoki-ryu and the like, became more established. In the mainline of the Katayama family in the Iwakuni domain it was called Katayama-ryu kenjutsu. Hisayasu was the swordsmanship instructor for the Kampaku (a title that originally funcutioned as chief advisor to the emperor) Toyotomi Hidetsugu for which he gained much fame. In 1610 he was summoned by the Emperor Goyozei, at which time he presented the secrets of Iso-no-nami for imperial inspection. At this time he was awarded the court rank of Junior Fifth Rank (Jugoige) and made governor of Hoki province (Hoki-no-kami). After this Katayama Hoki-no-kami served as swordsmanship instructor to both Toyotomi Hidetsugu and Hideyori (the son of Toyotomi Hideyoshi, the second of the three great unifiers of Japan). In 1615 the Toyotomi family was wiped out in the Seige of Osaka Castle and Hisayasu moved west, arriving in Suo in Iwakuni in 1616. There he was given a stipend for ten people as a guest by the lord of domain, Kikkawa Hiroie. Here Hisayasu became the sword instructor to Hiroei’s son Hiromasa and married the daughter of one Saeki Kichibei Tadanobu. After this the Katayama family served as martial arts instructors to the Iwakuni domain and Katayama-ryu was transmitted there until after the Meiji Restoration (1868). 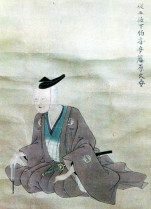 Hisayasu died on the seventh day of the third month on 1650 at the age of 76. After his death, his son, Hisataka inherited Katayama-ryu and after spending many years in Edo, returned to Iwakuni in his later years and served the Kikkawa family as well. After the fall of Osaka castle, the art of Hoki-ryu (iaijutsu) came to be transmitted in the area around the Kumamoto domain through one Asami Ichimusai, a student of Hisayasu’s. Hosokawa Tadaoki (posthumously known as Sansai) is well known for devising the Higo-koshirae, a practical style of sword fittings well suited to iai, and Hoki-ryu became deeply rooted in the Kumamoto area. In 1776, Hoshino Kakuemon Sanesada, a teacher of the Asami line of Hoki-ryu, went to Iwakuni and studied under the fourth generation family head Katayama Risuke Hisayoshi. After that the kata (prearranged forms used in training) of the Katayama family were included in the Hoshino dojo’s teachings and the foundations of the Hoshino-ha (branch) of Hoki-ryu were created. At this time in the Kumamoto domain, multiple lines of transmission stemming from Asami Ichimusai existed (the Kumagai branch, the Noda branch, etc), but today the Hoshino branch from the Hoshino dojo in Kumamoto is generally the most widely known art going under the name of Hoki-ryu. In 1804, after Kakuemon’s death, Hoshino Ryusuke Sanetoshi (Kakuemon’s adopted son) became the second generation of the Hoshino family to go to the Katayama family and study Katayama-ryu. Hoshino Ryusuke studied under the sixth generation head, Katayama Tomoinosuke Hisatoshi for approximately a month and a half and was awarded various transmission scrolls such as the Jo-mokuroku, Nito Kuzushi and Kobokuto. In 1888 the fourth generation of the Hoshino family of Hoki-ryu, Hoshino Kumon Sanenori went to Iwakuni and studied under the seventh generation head of Katayama-ryu Katayama Honzo Hisatoshi. In 1938, The fifth generation, Hoshino Ryuta Saneshige received instruction in Katayama-ryu from the final head of the Katayama family, the eight generation headmaster Katayama Busuke Hisamichi who traveled to Kumamoto. Katayama-ryu continued to be transmitted within the Katayama family in this manner durning and beyond the Meiji Restoration, but due to the passage of time and changes in society, Katayama Busuke ended up being the final family head of the art in the eight generation. Meanwhile what is now called the Hoshino line of Hoki-ryu passed down in the Hoshino dojo in Kumamoto spread throughout Japan starting in the Kansai area in Kyoto with teachers like Yoshizawa Ikki and Ono Kumao who were originally from Kumamoto.